CALGARY — Oliver Kylington had his first NHL goal and helped set-up the game-winner as the Calgary Flames grabbed first place in the Western Conference with a 5-2 victory over the Nashville Predators on Saturday night. The decisive goal came from Garnet Hathaway, who broke a 2-2 tie at 6:03 of the third period, neatly deflecting in Matthew Tkachuk’s point shot. Kylington, a 21-year-old rookie defenceman, had the second assist. Sean Monahan, Alan Quine, with his first goal as a Flame, and Elias Lindholm, into an empty net, also scored for Calgary (19-9-2), which won its fifth straight game and overtook Nashville by one point for tops in the West. Johnny Gaudreau with two assists and Lindholm with two points extended their point streaks to seven and six games, respectively. Calgary’s Mike Smith made 25 saves to improve to 11-7-1. The 36-year-old has won six straight after a rocky start to the season resulted in him being relegated to the backup role for four games in a row in mid-November. Nashville backup Juuse Saros made 20 saves as Pekka Rinne got the night off after getting pulled Thursday night in a loss in Vancouver. His record falls to 7-5-0. Colton Sissons and Craig Smith replied for Nashville (19-10-1). The Predators are winless in their last six games on the road (0-5-1). 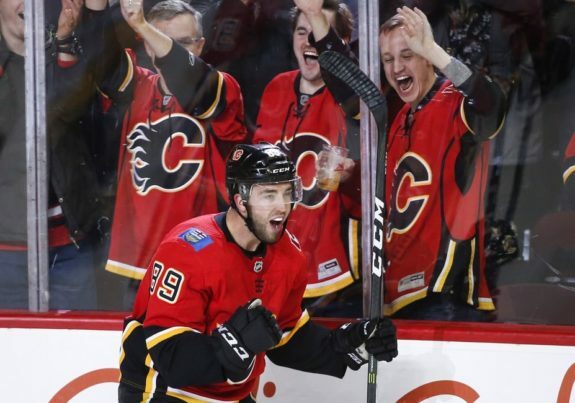 The Flames got some insurance at 12:12 of the third when Quine — recalled earlier in the day from the AHL’s Stockton Heat — made it 4-2 on his first goal of the season off a set-up from rookie defenceman Rasmus Andersson. Quine, 25, had six NHL goals in 84 career games with the New York Islanders. He was inserted into the line-up with the Flames missing Mikael Backlund (concussion), who was injured Thursday, as well as Ryan Lomberg and captain Mark Giordano, who both received two-game suspensions from separate incidents in that same game against the Minnesota Wild. Calgary struck first just 1:12 into the game when Kylington took a pass from Lindholm and fired a rising shot over Saros. His first goal and point comes in career game No. 7. The Predators tied it in the final minute of the first when Roman Josi carried the puck down the wing and feathered a pass in front that neatly tipped past Smith by the outstretched stick of Sissons. Monahan restored Calgary’s lead late in the second when he was left with a free path to the front of the net and he scored his team-leading 18th goal on a backhand. Smith tied it 2-2 early in the third on a wrist shot from a bad angle that dribbled through Smith. Notes: Calgary’s Mark Jankowski played in career game No. 100… Calgary improves to 14-2-0 when scoring first… The Flames win the season series 2-1.